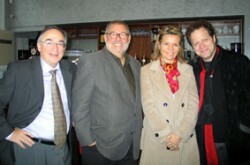 Preparation for the ICMA Gala Concert and the Award ceremony 2012 took a notable step with a meeting between the three major partners for this outstanding event on May 15th at La Cité in Nantes (France). La Cité’s marketing director Corinne Denuet, Michel Ayroles, General Manager and John Axelrod, Music Director of the Orchestre National des Pays de la Loire, and ICMA’s Jury President Remy Franck met on the spot to set up the key elements for the evening’s organization. The Award Ceremony will take place on the 15th of May at 18.30 at the Auditorium 800, followed at 20.30 by the Gala Concert at La Cité’s main auditorium which seats 1.970 people. John Axelrod will conduct the concert, broadcast live by France Musique and in deferred mode by Radio MDR (Germany), Radio 100,7 (Luxembourg), Radio Orpheus (Russia) and numerous other EBU radio stations. Winners of the ICMA 2012 will perform during that concert. Highlights of the unique evening will be coming from Beethoven’s Triple Concerto, Prokofiev’s Third Piano Concerto which will be heard as well as Penderecki’s Sinfonietta and Liszt’s Danse Macabre. The rest of the program will be known early in 2012. For ICMA 2012 the world’s finest musicians, label managers and representatives of the music industry will gather in Nantes to celebrate musical excellence.